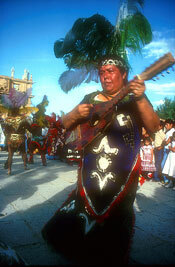 Mexico is a land rich in folklore. Music and dance, two of the oldest expressions of cultural form throughout the world, were intimately linked, in ancient times, to agricultural and ritual festivities and calendar cycles, and were patronised by specific deities, to whom offerings were regularly made. Tiny statuettes of jade, stone and clay show clearly that dance, probably associated with invocations of rain, was already well developed in Mesoamerica as early as 1500 BCE, in the Preclassic (‘Formative’) period. 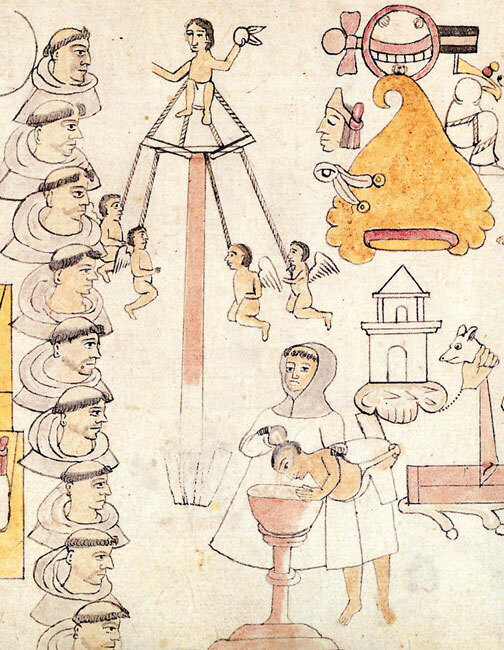 From the few descriptions handed down to us by Spanish and Mexican chroniclers (Sahagún, Torquemada, Motolinía, Mendieta, Landa, Durán, Clavijero) we know that by the early 16th century dance had not only evolved into carefully choreographed mass ceremonial spectacles - in which hundreds, if not thousands took part, including the emperor, in perfectly coordinated concentric circles - but was directly associated by the Mexica with individual health and medical cures: the god Ixtlilton (patron deity of dance) was the brother of Macuilxochitl and Xochipilli (gods of music, song and games), all three representing different aspects of good health, pleasure and general wellbeing. If we consider the details, like the costume of the enormous mirror-trimmed and plumed headdress and the heart-shaped sceptre held in the left hand, or the majestic forward, backward and circular movement, and the ritual bow to the four cardinal points, we discover that the modern significance is only a disguise for an ancient ceremonial rite. Furthermore, the headdress, the use of a bright-coloured cape, the silk-banded, gold-fringed pantaloon, the apron covered with silver medals and coins, all suggest the appearance of a brilliant, crested bird. This is Quetzalcocochtli, the bird that sings at dawn, and is the image of Macuilxochitl whose feast, Xochilhuitl, festival of the flowers, is still celebrated in the city of Oaxaca. In this moveable feast, which ordinarily falls on the fifth day of its calendar sign, an individual dresses as the god and carries his heart-shaped sceptre. 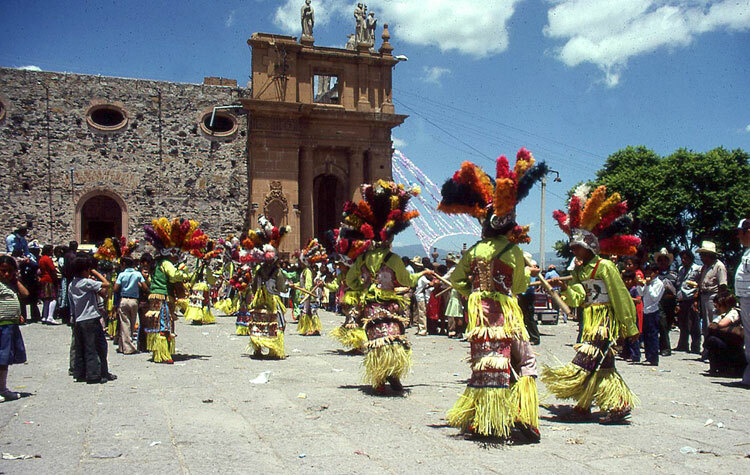 All these details leave little doubt that the dance nowadays performed in Oaxaca as the Feather Dance must have been that of Macuilxochitl, the god of music, song, dance and courtly nobility. 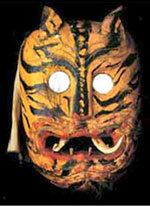 ‘In all ceremonial dances’, stress the researchers, ‘the Indians express their devotion to gods and land. 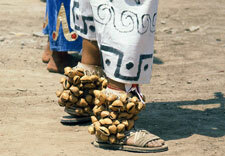 They love their fiestas, but they put their heart and soul into dances inherited from their fathers for rain and crops. 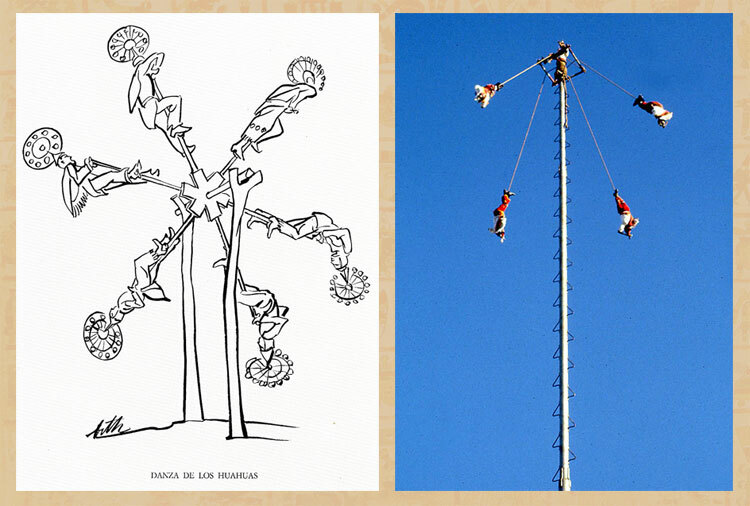 In these they retain memories of the past.’ Some dances extend the link to agricultural ritual to worship of the sky, the sun and to ancient calendrical cycles. 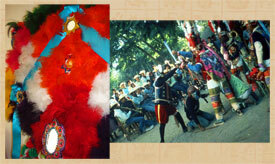 Within this genre the Quetzales dance from the Sierra de Puebla (pic 5) is a useful example. 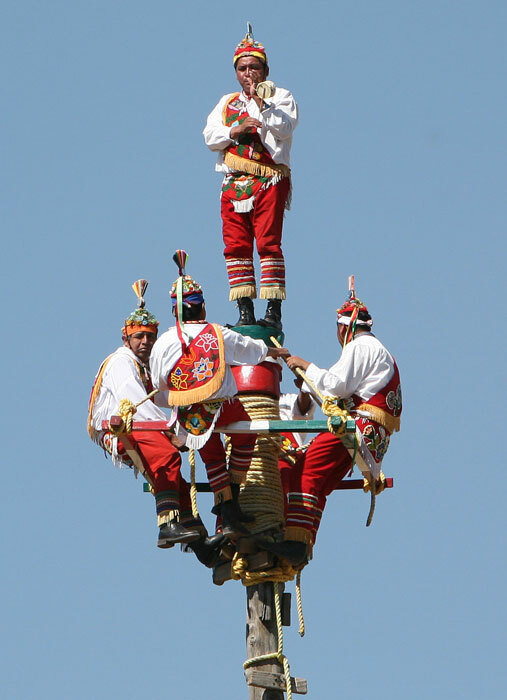 Linked to the much more famous Voladores (below), this dance, with its Totonac cousin the Danza de los Huahuas, apart from being one of the most colourful in the Mexican folk repertoire, is well-known for the spectacular circular - and solar-like - headdresses, formed from a framework of reed, paper strips, ribbons and feathers (the rest of the costume is clearly of European origin). 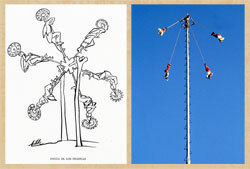 Key to the performance is a finale in which some of the the dancers mount a wooden contraption consisting of a rough spoked wheel on an axle suspended by tall stakes. With their headdresses swaying majestically, the dancers revolve slowly, mimicking the rotation of time and the universe (pic 6). The costumes are the same as those of other dances of the Puebla highlands, a far cry (thanks to the Spanish) from the splendid eagle and other bird costumes worn by the participants’ ancestors. Positioned perilously atop the tiny platform (a foot in diameter!) 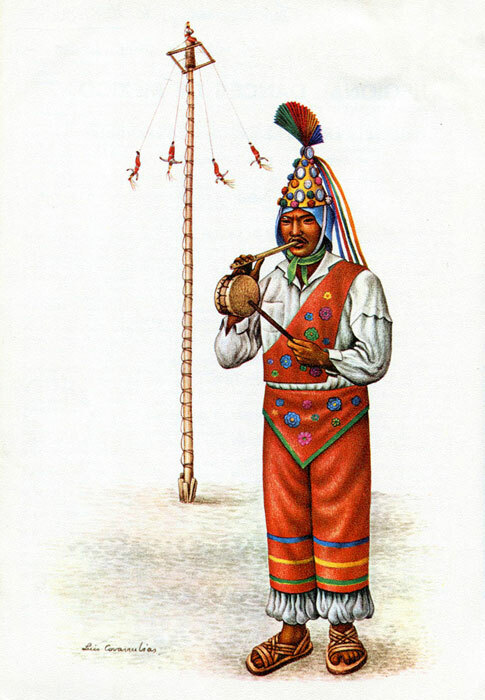 the musician alternately stands and sits, jumping/dancing, swaying backwards and forwards, greeting the four cardinal directions, all the time playing a small reed whistle and tiny drum (according to Kurath and Martí each stage of the ceremony has a special tune). 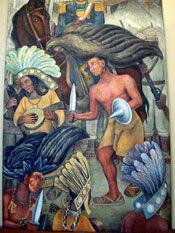 Encouraged to leap several inches into the air, the role of dancer-musician is singularly dangerous (Gallop recorded a death two years previously), and the performer is chosen a year in advance: ‘during that whole year he is treated with special consideration, overwhelmed with attentions and granted his slightest wish’ - a striking parallel with the Aztec youth chosen to be Tezcatlipoca impersonator in the annual Tozcatl festival. 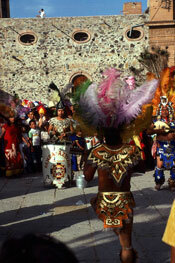 Several writers have commented on the contrast between what by all post-Conquest accounts appears to have been the ‘formal and ornate choreography’ of ceremonial Mexica round dances, infused with religious, solar and sacred geometrical forms and symbolism, rigorously and perfectly executed, led by a professional director, accompanied by strongly rhythmical, almost hypnotic percussion - and the shuffling, sometimes ‘incoherent’ and ‘incongruous’ aspects of many of today’s hybrid Mexican folk dances, accompanied largely by European instruments. Yet in many ways a flourishing of dance forms has occurred (in the last century one national festival of folk dances included over 90 different dances, and these were just a fraction of those known to exist...) The majority are mestizo dances, but there remains a sizable minority of ‘indigenous’, ‘native’ dances, performed not for entertainment but to keep faith with the local religious and festive calendar. 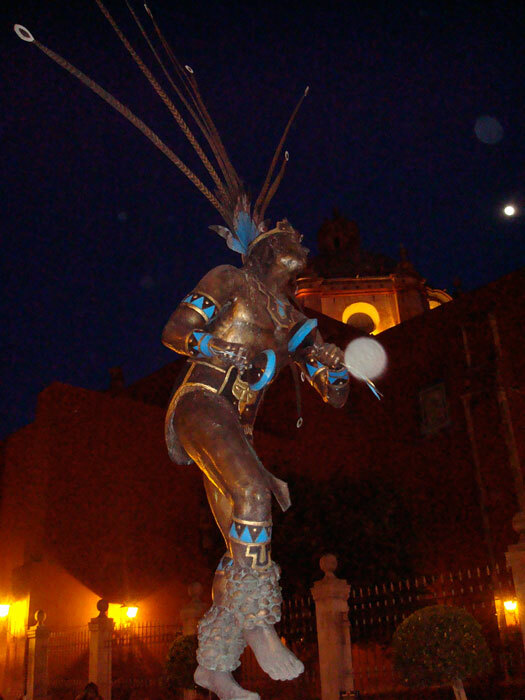 Perhaps the best example of a dance genre that is a rich - and constantly evolving - mix of ‘native Mexican’ and European is that known as ‘Concheros’ or Danza Azteca. Mario E. Aguilar, one of its contemporary performers and teachers in the USA, has described it to us as ‘a complex evolution of Mesoamerican dance, Catholic religion, and Spanish instrumentation’. Today a vibrant art form, it has become something of a movement - inevitably perhaps leading to different schools and perspectives within it. ‘Concheros’ - its traditional name - derives from the Spanish word concha or ‘shell’: so called because in the past the instrument most closely associated with accompanying Concheros dances has been a guitar whose soundbox consists - very effectively - of a large armadillo shell. Counting on tens of thousands of participants, danzantes, as they’re known, belong to strict religious brother- (and sister-)hoods that rigorously exclude outsiders. 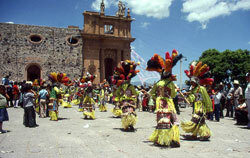 Governed by and following what have been referred to as military-style statutes, duties, responsibilities and rites, each regional troupe of danzantes engages in a series of elaborate pre- and post-dance rituals, including prayers, ritual cleansing, invocations of the ancestral spirits and natural forces, to the extent that, in Aguilar’s words, ‘90% of La Danza Azteca goes on out of sight to non-danzantes’. 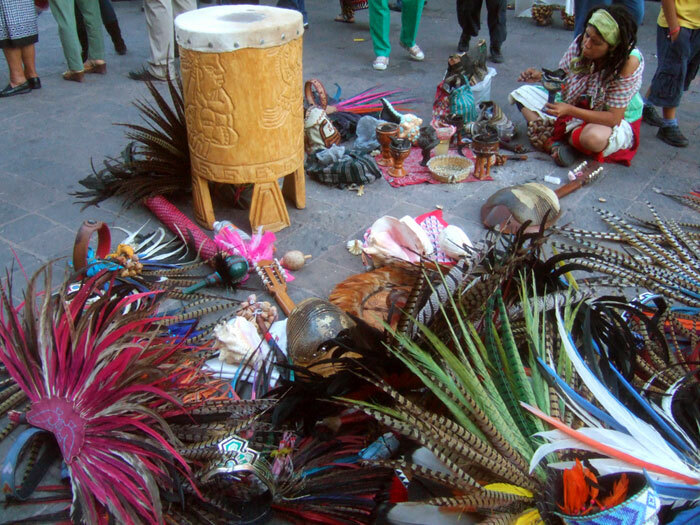 Their dance ceremonies, traditionally held in sanctuaries located at the four cardinal points and at their intersection, begin with conch shell blowing, incense burning and invocations to the four winds and to the souls of the concheros. They then launch into highly rhythmical music-and-dance routines that Gallop described, nearly 80 years ago, as having ‘a quality of tense, fanatical, ecstatic fervour which I have seen in no other Indian dance and which can be almost frightening.’ According to tradition, this ‘fervour’ has its roots in danzante beliefs both in being direct descendants of pre-Hispanic peoples (specifically, the war-like Chichimecas, whose dances they have inherited) and in their commitment to spreading the Catholic faith, inspired by a legend born out of the Spanish Conquest of Chichimeca territory (modern-day Querétaro) in 1522. 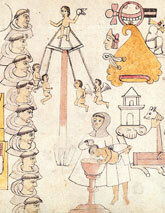 Unusual among Mexican dances - the large numbers involved, including women, performances commonly held in major cities, unique hybrid instrumentation (the conchas, large vertical Aztec drums played aggressively with beaters rather than hands as in pre-Hispanic days...), hierarchical organisation, etc. 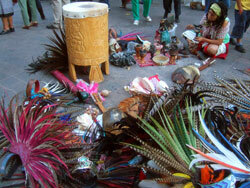 - Conchero ceremonies seem always to have appealed to rural migrants seeking a substitute for lost community roots. There’s little doubt that the majority of their participants are mestizo (mixed-descent). 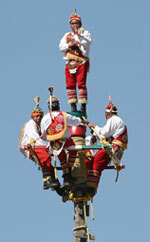 In recent years - Aguilar says since the 1940s, though the process has accelerated dramatically since the 1980s - the Danza Azteca movement has become much more politicised, with some dancers moving to reject elements of their tradition containing Spanish antecedents: as a result, concha guitars are losing popularity in favour of percussion-only accompaniment, dancers are opting for more simple garb - at times just loincloths and feathers - and a new style is emerging, seeking to (re-)discover a ‘pure Aztec’ heritage, even though, as we noted before, quite how the Mexica danced no-one really knows today. 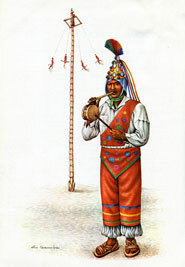 • Mexican Native Dances by Luis Covarrubias, Eugenio Fischgrund, Mexico City, n.d.
• Historia General del Arte Mexicano, vol. VI ‘Danzas y Bailes Populares’ by Electra L. Mompradé and Tonatiúh Gutiérrez, Editorial Hermes, Mexico City, 1976. 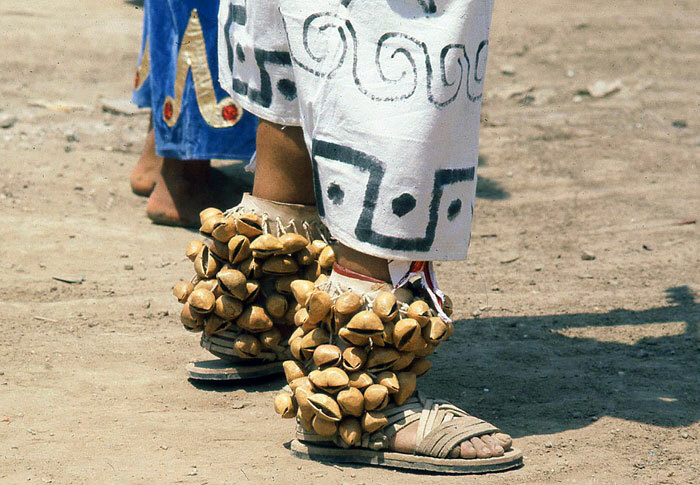 Special thanks are due to Mario E. Aguilar, Arnd Adje Both and Susanna Rostas for their most helpful personal communications on the topic of the Concheros dance tradition. • Pic 11: photo by Chloe Sayer. Q. What do you call a small guitar with an armadillo shell as the soundbox? Excellent article. I myself am a dancer and find the information accurate and interesting for the general public. I really liked the sources consulted. Modern Aztec dances have reconnected people who practice them to their roots in many significant ways. Wonderful article! The explanations of the dances’ symbolism was fascinating. 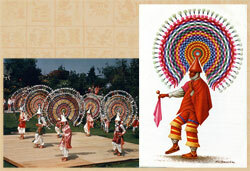 It’s great that people are revitalizing the Aztec dances today. I was lucky enough to see a modern Aztec dance live and it was magnificent. 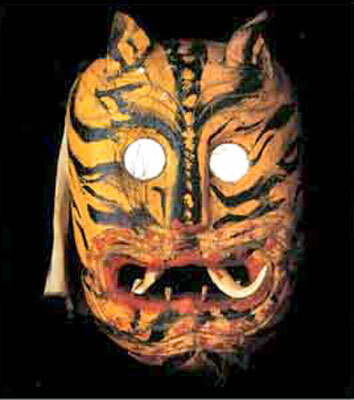 The connection with the Pueblo cultures was a intriguing point too. Among the Pueblo people, many of their indigenous traditions have survived christianization because the people cleverly substituted the symbols and characters of christian religion in their ceremonies. The pictures were great, but the picture of the Pueblo people wasn’t the best choice. 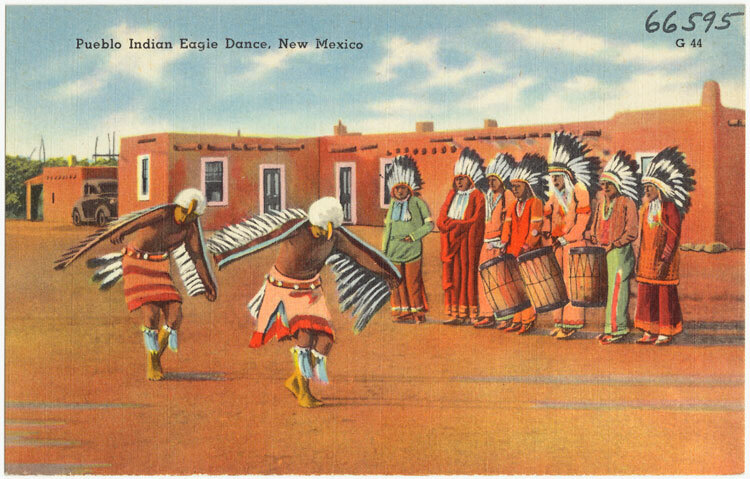 The eagle dances look authentic enough, but the pueblo people NEVER wore the stereotypical “war-bonnets” of the plains cultures like those of the Sioux. Mexicolore replies: Thanks, Katia. 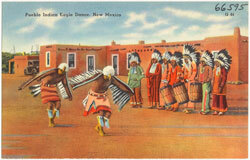 If someone can point us to a better image for the Pueblo eagle dance, please do and we’ll replace this one!